Tank Fittings - Modular Tank Fittings | ModuTank Inc.
ModuTank Inc. has developed a flange type bulkhead fitting featuring a single hole penetration for the pipe. Bolts do not penetrate the steel wall or liner, thereby greatly reducing the potential for leaks. Tight leak-resistant connections are achieved by adjusting pressure on wide, thick gaskets that seal the fittings to the wall. The fittings are available in stainless steel, carbon steel and PVC in standard sizes from 2” to 24” piping. They are equally suitable for new and existing steel, concrete, and plastic tanks and for tanks with membrane liners. Expansion joints are supplied to eliminate stress problems due to piping misalignment or tank flexing. 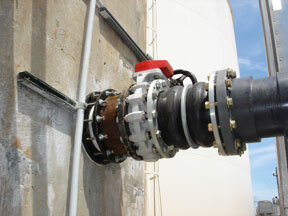 Exterior piping and ancillaries are attached to outside flanges on expansion joints. 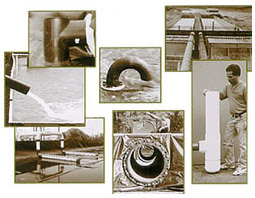 Typical Piping All ModuTank Inc. containment systems can be fitted with standard or customized piping and tank fittings, including internal elbows, standpipes, sumps, bottom drains, over-the-wall piping, etc.